I haven't seen any mention of this previously. It also implies the T is jumping aboard the DMU bandwagon. And yes, it's on A1 of today's paper in the early edition. Lots of questions to be asked here, when the existing T lines can't meet full schedules. Re: Seaport to Back Bay rail line? I wonder why this has been kept such a secret forever, and all of a sudden it's (supposedly) getting built immediately. Tens of millions of dollars! And it duplicates the Silver Line! I can't wait to hear more about what kind of rolling stock they're getting. The two year lead time seems to be kind of... short. The route the trains would take to get to Back Bay would not really be practical assuming this will share tracks with Amtrak and the CR. Also I assume this will use the Worcester Back Bay Station, that is a lot busy main lines to cross over. The line will go from the World Trade Center and then pass by Broadway on the Red Line, then close to South Station and over to Back Bay. You could just take the Silver Line directly to South Station and a train to Back Bay. Why does that area need an overpriced one seat ride? That money could be spent much better. I believe there's a psychological component to it. People know they can do Silver to Red to Green, or Silver to Red to Orange. But I'm willing to bet that the idea of transferring to the commuter rail for casual trips is a bit foreign to most riders. They take it into the city, they take it out of the city. That's it. They know their lines and AM / PM trains. The idea of going up from the SL to find the next random train to BBY is just not going to register. But you know, with a marketing campaign, it might. However, there's the tourists to consider. The conventioneers. That crowd is highly unlikely to make the jump to finding the next CR train to Copley Square and vice-versa. They're already overwhelmed by the fact you can't take the E line to Kenmore. Drop a concrete platform with a basic shelter at the Convention Center along with a digital sign saying "The Next Seaport Express Departs for Back Bay in X Minutes" and you've got a solution. It also helps keep plans for expensive SL3 kludges from gaining momentum. This plan effectively ends any dreams of seeing that project come back to life. Saw a very detailed takedown of this idea elsewhere on the innerwebz from F Line. Hoping he'll post it here, too. Although I can't exactly take credit for this plan, I can say with all honesty that I proposed this at one of those MBTA / MassDOT / EOT public meetings perhaps as long as 5 years ago. I believe it was when Rich Davey was still the MBTA GM, and he was there at that public hearing along with CFO Jon Davis, Director of Planning & Development Joe Cosgrove and Frank DePaola who was Assistant General Manager for Design and Construction at that time. Part of what I said at that hearing was the importance of the Blue Line to Lynn extension and the Red/Blue connector if Suffolk Downs got a casino (that's another thread) but I also said the line to the Seaport District would be a quick solution to South Station track overcrowding. My idea was to use the wye near the Herald plant to divert some trains after Back Bay to a new stop at the BEC. (I didn't have DMUs in mind at that time, just diverting some regularly scheduled trains to the Seaport... perhaps 1 train out of 5?) I can't say whether my idea at the time was a brand new one, but I distinctly remember seeing lots of wide eyes and nodding heads among the top brass that were there. I truly got the impression that they were thinking "hey that's a really interesting idea". Again I can't say I'm the first or only one to suggest this route option, but I definitely put it out there in a public forum to all the MBTA bosses. Perhaps I got the ball rolling in some small way. This is one of the most absurd ideas I've heard. I'd rather see the Silver Line trenched under the Worcester Line leads into Back Bay Station. You have to make a reverse move in the busy Southampton Yard, then proceed up to the single track Wye, cross the severely congested NEC/South Station leads, and then occupy a track at Back Bay for reversing. sery2831 wrote: The route the trains would take to get to Back Bay would not really be practical assuming this will share tracks with Amtrak and the CR. Also I assume this will use the Worcester Back Bay Station, that is a lot busy main lines to cross over. The line will go from the World Trade Center and then pass by Broadway on the Red Line, then close to South Station and over to Back Bay. You could just take the Silver Line directly to South Station and a train to Back Bay. Why does that area need an overpriced one seat ride? That money could be spent much better. You raise some valid points, but it seems a fairly inexpensive means to relieve some pressure on the Silver Line, which is close to capacity. But the actual service is not the story in my opinion. The real story is the 'T is buying DMU equipment. This busts open a whole range of exciting possibilities. This is a cool plan. Will make my life easier as someone who often gets an express bus into Copley. Consider also that this makes it a lot easier to get from the airport to Copley as well. Do we know what the exact stops are? Also, can they really order and receive trains in 2 years? I guess if they're DMU's it's a lot easier to go "off the shelf." BostonUrbEx wrote: This is one of the most absurd ideas I've heard. I'd rather see the Silver Line trenched under the Worcester Line leads into Back Bay Station. You have to make a reverse move in the busy Southampton Yard, then proceed up to the single track Wye, cross the severely congested NEC/South Station leads, and then occupy a track at Back Bay for reversing. In the article they state that new track will be constructed to eliminate the reverse move- the diagram seems to show them crossing the Old Colony (itself seems like an issue) and then using part of Widett Circle to access the U track that avoids South Station. So still a lot of questions to be answered here. 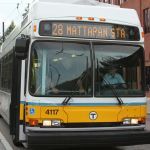 I don't really see that this could be accomplished easily- I will say that the Silver Line to the Commuter Rail for one-stop is a difficult option due to fares (an issue that doesn't need any more rehashing); a DMU could presumably just use Green Line-type fareboxes and allow for much easier interconnectivity in that sense. DMUs are great. Hopefully the Nippon Sharyo DMU's work out well, and can become a modern day successor to the RDC. This seems to be a lot of effort at solving a problem that it'll struggle to keep up with - a lot like the Silver Line itself. I think they used BRT in the wrong place, on the main SL truck itself. Aspects of BRT would have been great for airport service and for some other connections, but this will never be able to meet the capacity needs of that convention center to Back Bay hotels that they're talking about without a seemingly much higher capital investment. Are they really going to have the DMU's stopping on the Old Colony main line to change ends, and then doing so again at Back Bay on the through tracks? Or are they going to to run them through out to Yawkey and then change ends up in Beacon Park (not a bad idea, but does increase the turn time and thus operating costs)? *edit* Snipped the part about the reverse move on the Old Colony - read the article on my phone and didn't see the graphic. But that's still not going to be easy to push this kind of service through yard trackage - that seems to open it up to plenty of delays. When they start talking about the numbers coming to/from the Convention Center, is this single track branch line, awkwardly accessed, really going to be able to offer the capacity? Making a direct connection off track 61 looks horribly expensive. Of course, if we had a Green Line branch via the ethereal Stuart St Subway, continuing on into the SL waterfront tunnel, we wouldn't need a DMU shuttle to get people to Back Bay. If these DMUs work, they could do a lot of good on the existing northside lines. Lot of runs up there which don't need a full 5-7 car set, or could benefit from better frequencies with shorter sets. That's in addition to all the places on the southside that could do the same. What are these companies that are supposedly making FRA-compliant DMUs? This is the first I've heard of anyone building DMUs in the US since Colorado Railcar went bankrupt a few years ago. I assume the run would use the Framingham platforms at Back Bay. I assume a crossover is near BBY (IIRC, it was used for South Station-Back Bay shuttles when the NEC was closed) -- but if you're running that far out anyway, why not just go another mile down to Yawkey? Are there any crossovers between Yawkey and Beacon Park? Again, scads of questions remain. I wouldn't hold my breath.